The world's second most popular Scotch whisky is made by carefully blending together 42 different whiskies to create a subtle, smooth and complex flavour - designed for mixing. The delicate balance is what gives it a distinctive character, but the heart of the whisky comes from Speyside with its fresh, golden fruit. J&B champions the good that comes from uniting Independent Spirits.... Founded by an Italian, distilled by the Scots, blended by an Englishman - 42 individual whiskies blended to create J&B; a rule-breaking whisky since 1749. An easy to mix & easy to drink whisky; unpretentious & versatile; a smooth mixable spirit in a colourful pack. The original Party Whisky. The whisky of independent spirits from the 19th Century London gentleman's clubs to the Las Vegas rat pack; loved by the fashionably famous & royalty. A history of unconventional & surprising marketing. 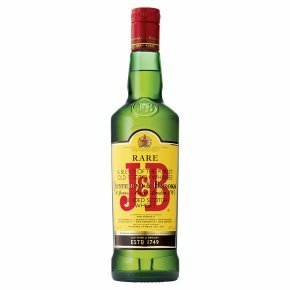 Inspired by an Italian, created in London and distilled in Scotland, J&B Rare is unlike any other Scotch whisky. It brings together 42 single malt and grain whiskies and carefully blends them to create a subtle, smooth and complex flavour. It's this delicate balance that gives J&B Rare its distinctive character - if we took even one whisky away, you would taste the difference. At the heart of J&B Rare are malt whiskies from Speyside, a region recognised as the superior area in Scotland for making single malt whisky. They provide the fruity, fresh quality you can taste, and also give J&B its light colour. Added to that are some of the finest grain whiskies Scotland has to offer. They help reveal the individual flavours of the various malts, unveiling the smooth character of J&B Rare. Great in a cocktail, the unique blend makes it perfect for mixing.